Fitdigits apps have the ability to create interval workouts based on pace and distance on your iOS device. In order to create them for pace, you have to have a concept similar to heart rate, where you use speed / pace zones to define effort levels. Not everyone cares to wear a heart rate monitor all the time, though that still remains the best way to train smart, pace can be a passable approximation. 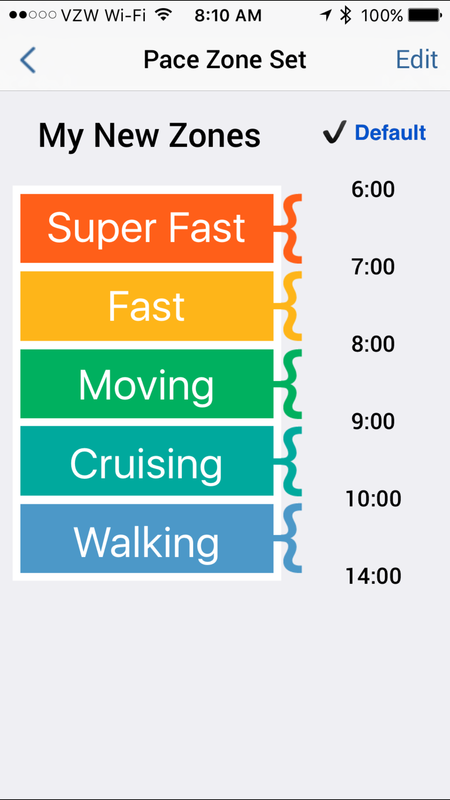 If you don’t know your pace zones, we offer in-app Fitness Assessments that will set both heart rate zones and pace zones personalized to your current levels of fitness. 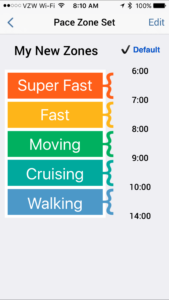 For example, if you are training for a 10K and targeting a pace of 8:30 minute per/mile, use this pace to set-up pace zones for your training and race day. Setting up custom Pace zones are very similar to setting up Custom Heart Rate Zones. Bring up the Activity on your home screen and tap the Gear / Settings icon for that activity type, then tap <Activity Type> Options in the Preferences section. Tap the Pace Zone you want to make default for that activity. Tap Set Default to set the zone as a default. You may edit any of the values on the page as well, see more on that below on Creating Pace Zones. Creating a zone set does not automatically make it default. Tap any complete zone set and tap Set Default to use that zone set with that activity. A yellow heart means the zone set has not been synced to the cloud. To save the set for use on other devices or re-installation or to manage zones on the web, tap Menu > Sync.